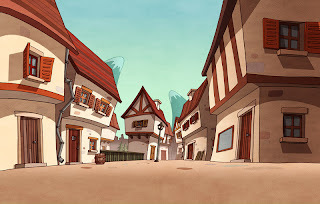 Here is a background from the Frankenstein's Cat series we worked on for Mackinnon and Saunders. We did the animatic, episodic props / character build, animation and backgrounds for 13 episodes which was a co-production with Kayenta in France. The BG's were traditionally drawn (on paper!!) then coloured in Photoshop. Yes I would like to live in the house by the lamp! Deja Vous. I'm sure I've been here before.. Is it that village just outside of Bath?